The Peak Deluxe Suit is a rear entry one piece suit with a curved flexible 5mm Tizip positioned over the shoulders and vertical relief 'fly'zipper made with Peaks heaviest duty X4 fabric. 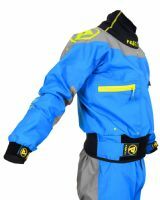 Based on the popular Deluxe Jacket you get an articulated fit thought the arms and legs for a comfortable fit. The neck seal is latex with a superstretch neoprene outer cone while the latex wrist seals are protected by Aquaout neoprene seals with velcro adjustment. The outer waist also uses velcro adjustable tabs. 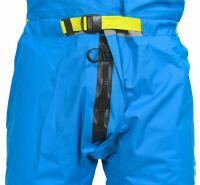 The inner waist features a webbing belt for adjustment. The Deluxe suit is reinforced across the shoulders, elbows, seat, knees and ankles. All seams are pre glued before taping to give dive quality seams.